Tawera Kerr-Barlow has a unique rugby heritage for a potential All Black - his mother Gail played half-back for Australia. The scrum-half is one of a crop of talented, young New Zealand half-backs and has earned All Blacks selection with his bruising defence and ability to make a nuisance of himself in classic half-back fashion. He made the Waikato age-grade sides before being selected for the Junior World Championship-winning New Zealand Under 20 side in 2010 and was picked for the Chiefs in 2011. 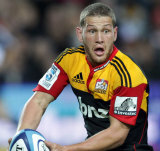 He played a leading role as the Chiefs won the 2012 Super Rugby title and was then rewarded for his efforts when he was included in the All Blacks' squad for their northern hemisphere tour.